You know how Jesus was Jewish but had a slightly different view of that religion and started his own called Christianity? Well, in India they had a similar guy. His name was Siddhartha Gautama. He was a Hindu prince who sought out to end suffering. He came up with his own 8-fold Path to Enlightenment and left Hinduism behind when he became... The Buddha ("Enlightened One"). The core beliefs about desire, suffering, and the search for enlightenment preached by the historic Buddha and recorded by his followers into sutras and other scriptures were, in part, a reaction to the Vedic beliefs and rituals dominant in South Asia. 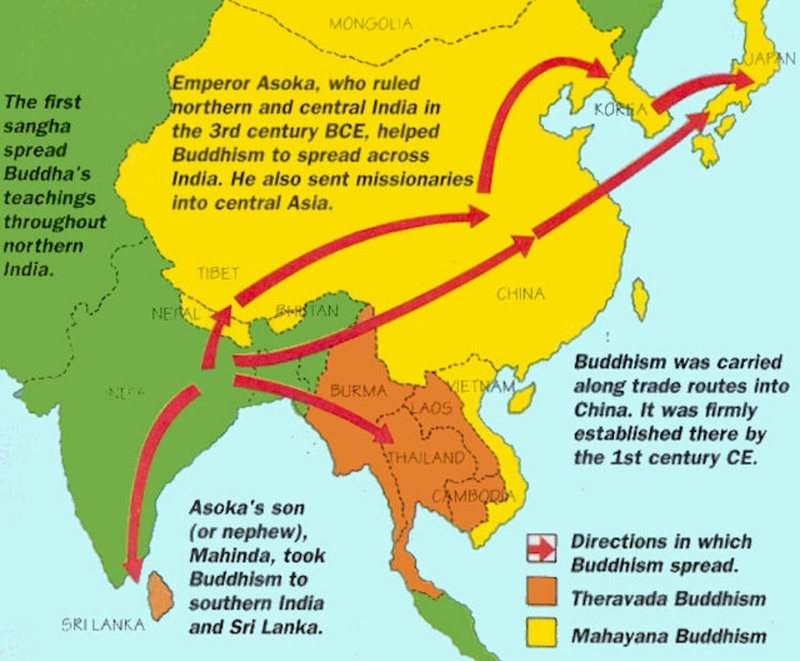 Buddhism changed over time as it spread throughout Asia — first through the support of the Mauryan Emperor Ashoka, and then through the efforts of missionaries and merchants, and the establishment of educational institutions to promote its core teachings. This covers India and Hinduism along with Buddhism. Just watch the last 7 minutes here.